Bing, a search engine owned by Microsoft has decided to go mobile friendly in order to cater the search requirement of the user on move. Along with the mobile friendly web pages, the company has also planned to rank higher the pages which are more mobile friendly in the search list. The algorithmic changes are expected to come in action in few coming months. The search from the Bing search engine will give adjusted result for mobile. 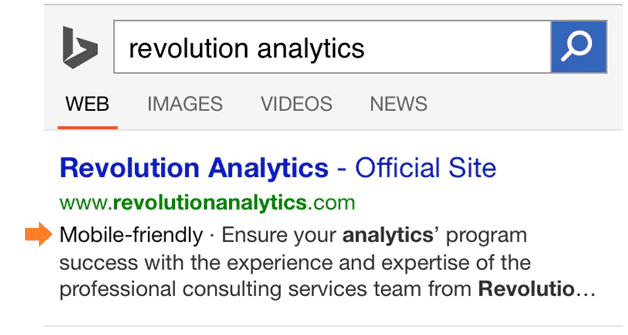 However the approach of Bing is not as like Google’s. Bing is not penalizing the websites whose web pages are not mobile friendly while Google has penalized a many websites for non-readable content on the mobile phones. The search result will be tagged with “Mobile-friendly” if the website is optimized for the mobile users otherwise it will not show the tag. The company received a lot of feedback based on which they told, “We have seen most of the people using the mobile friendly tagged webpages”. This will allow the users to opt the webpages to open so as to have a quick and better look of the website. The company will provide the search results for any query based on the relevancy of the mobile friendly sites. The changes don’t mean mobile-optimized sites will necessarily appear at the top of results. “You can always expect to see the most relevant results for a search query ranked higher, even if some of them are not mobile friendly,” said Microsoft. Microsoft is not going to penalize the websites as like Google. The main motto of both the companies seems same to attract more and more users by offering them a better platform for searching over mobile devices and tablets. Some factors that Bing thinks in a mobile friendly websites are navigation, readability, scrolling and compatibility. “A tool which will allow webmasters to analyze the webpages using the mobile friendliness classifier will also be available in few weeks. It will help Webmasters find and fix areas of their site that suffer from mobile friendliness issues”,shared Shyam Jayasankar, from Microsoft.